How do you create content that drives sales? It’s an often elusive goal for many businesses. Yet one of the incorrect assumptions that many blogging companies make is that their content isn’t ‘good enough’ to drive sales. Often, the content is fine, it’s just aimed at an audience that either isn’t ready for it. We see this with many companies that are creating content as a way to ‘build awareness’. Yet the content that they are creating is completely promotional in nature. A complete disconnect, based on their audience and goals. So what type of content is right for your audience? It turns out that there’s a very simple process to follow in order to figure out what type of content is right for your audience. You – Us – Me. 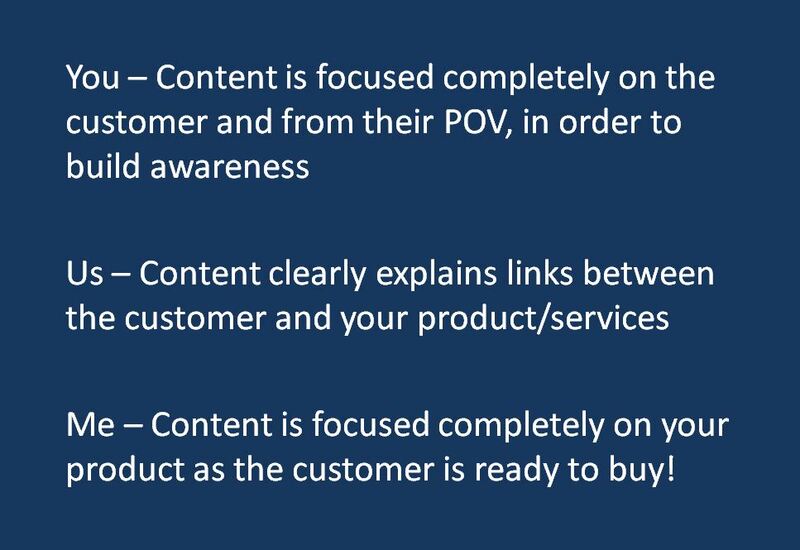 It turns out, there’s only three types of content you need to focus on: You (Content written completely from the customer’s POV), Us (Content that focuses on a link between the customer and your brand), and Me (Content written that’s completely promotional in nature). This content is written completely from the customer’s POV. You focus your content on select areas that relate to your products, but that aren’t about your products. The idea is to focus on areas that are important to your audience, but from the audience’s point of view. For example, let’s say your company sells cyber-security software. At this stage, your content would focus completely on helping your customer understand how to be more secure online. You don’t talk about how your software can help with this….YET. At this stage you are only giving the customer content that helps them become more secure online. This content helps build awareness, because it is completely focused on the needs of the customer. Here, you create content that focuses on a link between the customer and your software. You are still focusing on cyber-security, but here you will focus on specific areas of cyber-security that your product addresses. This helps the customer become more secure online, but it also helps them understand how your software will benefit them as well. At this stage the customer is beginning to understand how your software could benefit them. Now, the behavior of your customer has shifted again, so you also shift the focus of your content. By this stage, the customer is interested in purchasing cyber-security software. So you shift your content to focus exclusively on the benefits of owning your cyber-security software. You talk about the benefits of owning your software, and also give some insights into how the software works and what problems it solves. THIS is where you sell. You sell here because the customer is finally READY TO BUY. The customer is doing research so at this point they WANT content that’s focused on your software because they are considering a purchase. You can use the You – Us – Me process to easily determine what type of content is best to create. If you want to build awareness, then you always create content focused completely on your audience. The reason why is because the audience has no idea who you are (which is why you are trying to build awareness with them) so you focus completely on them, in order to win their attention. If you want to create content that sells, then you need to understand if your audience is ready to be sold to. If they aren’t aware of who you are, then you don’t sell to them. If they are slightly aware of who you are, then you create content that helps them understand the connection between what’s important to them, and how your products/services relate (Let’s Talk About Us). If your audience is researching a purchase, then you talk about yourself. You give the audience more promotional and product/service-specific content, because that’s the information they are looking for. Think about who you are trying to connect with, and where they are in their buyer’s journey. 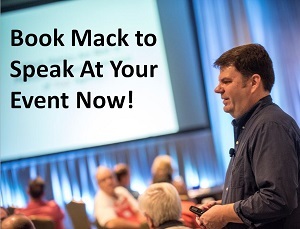 That will determine if your content should be focused on You, Us or Me. Once you know where the customer is, then you can create the content they need currently, and give them Calls to Action that move them to the next level. Simply giving consideration to what content the customer currently needs will greatly increase the effectiveness of your content strategy. Interesting way of looking at where to target content. I’ve seen firsthand that pushing out “me” content to brand new audiences (who need “you” content) can result in no conversions. It’s important to think about these things to prevent you from wasting time on content.